Volunteering: a sustainable solution to Greece's refugee crisis? In an ongoing economic crisis, how long can Greece's reliance on volunteers last? This past summer, I lived in Athens, Greece. On one of my last nights in the city, I went out for a drink with a friend of mine, Vagelis, a Greek who has lived in Athens for years. We had been talking about journalism in Greece, and as we got ready to leave the bar at the end of the night, he asked if I wanted to see something. It’s the real story, he told me. It was dark, and as we drove through Omonia Square, I noticed the sidewalks were almost bare - most residents had already left Athens for the summer. Suddenly, we stopped in front of a park. Vagelis pointed to it, saying that this place, Pedion tou Areos, was where the refugees live. He said that at night it was not so apparent, but during the day, it was easier to see the conditions inside the park. Then, he said that he had donated some extra supplies he had gathered before a storm (such as paper towels and canned foods) to people running the camp. This surprised me at first. At this point in early August, the Greek economic crisis was still a bigger part of the news than the refugee crisis, and I knew that almost everyone was somehow affected financially. Was this unusual? Some organizations and individuals have been volunteering independently from the Greek government even before the summer’s influx of migrants. The sustainability of this volunteer movement under the current economic conditions is difficult to predict. Right now, volunteers are able to shoulder some of the burden, but the ongoing migrant crisis is only further straining the Greek government. The UNHCR released a statement saying that more processing centers need to be opened, which can only be done with more money. Despite the fact that the Eurozone has recently begun to improve economically, the financial future of Greece and the future of refugees in the European Union remains uncertain, especially since Greece has a long recovery ahead and more refugees enter the country daily. Some volunteers find other ways to help migrants. A school in the Kolonos neighborhood of Athens was actually founded in 2004 as a response to the Golden Dawn, Greece’s fascist party, and was originally intended as a way to teach incoming migrants Greek. Attendance used to be around 500 migrants every year, but now they enroll only 200 from around the world. A representative from the school told me that migrants don’t invest their time in the Greek language. Most are only stopping in Greece on their way to another European country, so instead of intently focusing on teaching the language, they use the school as a way for people to socialize. The school is staffed by about 50 teachers, all of whom work as volunteers. Other organizations have also had to adapt to the migrant crisis. 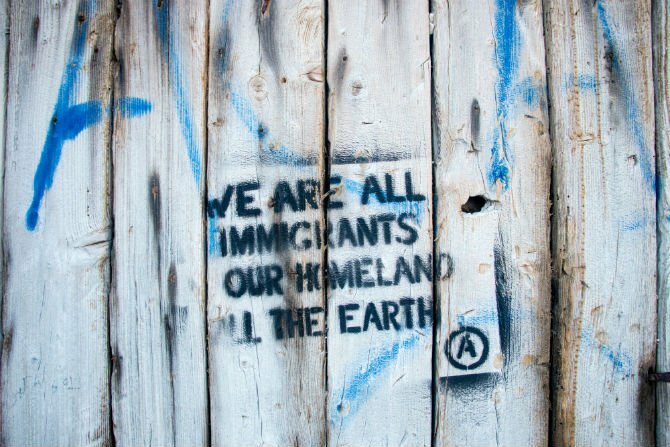 The Greek Forum of Refugees was founded in 2010, and it functions as a network for the refugee community. The organization’s president, Yonous Muhammadi, told me they help refugees from around the world, including Afghanistan, Sudan, Syria, and Nigeria. “What we are doing is informing the refugees about their rights and responsibilities,” said Muhammadi. They act as a “bridge between these communities and the NGOs and authorities on the Greek level.” His organization also functions as a resource for reporters and media in and out of Europe. “We have contact with asylum seekers and we know the reality, so we try to disclose it,” he said. But the economic crisis can limit these efforts. For Muhammadi, one of the major challenges is keeping their office running. “There is no support from Greece or Europe,” he said, so they struggle to gather the money to pay their monthly rent. And because the workers there are unpaid volunteers, their ability to help is limited by their need to support themselves while using their time and resources to help others. 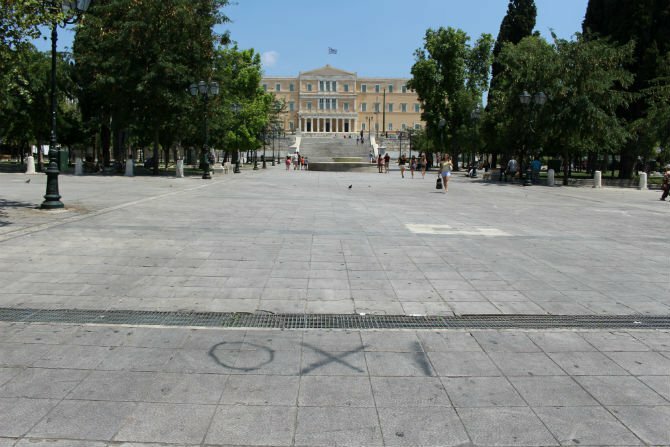 Graffiti from a protest in Athens against staying in the European Union. However, social media may be the new method of volunteering. One Facebook group, Campaign for the Rescue of Unaccompanied Child Migrants in Greece, coordinates volunteer efforts from around the country and even the world. Members post lists of supplies that are needed at various camps and keep members updated on policy changes in Greece and the European Union. Perhaps most striking, however, are the photos uploaded to the group. They show the conditions of camps and illuminate the reality on the ground in Greece, one that is perhaps not always conveyed in the media. I noticed that these networks are expanding beyond Greece into other European nations, such as Croatia, Serbia, Germany, and Sweden. Grassroots efforts are growing stronger, while the response from the individual states and European Union has been weak. The solution to the refugee problem has to come outside of Greece, and even outside Europe. Nanou points out that any resolution will need to get at the root of why people are leaving their home countries in the first place. Perhaps one way to support this need for a global response is through a worldwide initiative to help these people instead of relying solely on localized efforts. Recently, a funding campaign sponsored by both the UNHCR and Kickstarter raised enough money to provide assistance for over 7,000 refugees, and the UNHCR is continuing to accept donations. Is this the future of volunteering for nations that are inundated by refugees? Currently, there is no alternative. While people like Vagelis are able to help in the short term, a more concrete, worldwide solution is needed for the future. This piece was contributed by Katie Whittaker, a graduate student at NYU working on a masters degree in journalism and European and Mediterranean Studies. Katie lived in Greece in 2012 and returned last summer to write about the country's economic and humanitarian crises. She loves to cook and frequently spends too much money at farmer's markets.